Some authors write good books once in awhile with clunkers in between. Anne McCaffrey, for instance, with all of her brilliance, still managed to pump out some really bad fiction. I'm looking at you Petaybee. Then there are the authors you can rely on to be entertaining, thought-provoking, and talented. Tamora Pierce and Brandon Sanderson are two of those authors, and so is John Scalzi. The first Scalzi book I came across was Redshirts, which I read in line at Baltimore's Comic Con, waiting to meet Stan Lee. It was the first book I ever read on a tablet, by the way. I have since read and enjoyed several Scalzi books including Fuzzy Nation and Lock In. The latter is far and away my favorite of his books, so far. That's why I was so glad when I got my hands on the audio book for the sequel, Head On. Once upon a time I was a psychology major and, ever since, I have been fascinated by the way our minds work and how our minds affect our bodies. In locked in syndrome the patient has no access to the outside world but can be completely conscious and aware. I wish that Scalzi had invented this disease for the book but it is a real condition. After reading Lock In I stumbled across Ghost Boy: My Miraculous Escape from a Life Locked Inside My Own Body, the true story of a real-world survivor of this condition. As I read it I kept wishing that the solution in Lock In had been available for Martin. That's where fiction is better than reality. 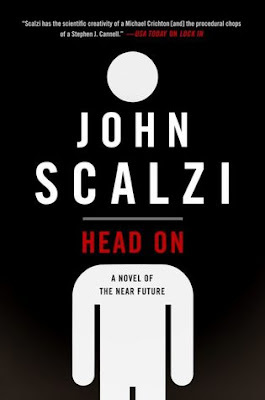 Scalzi takes this condition and finds a way for the patients to escape the bonds of their frozen bodies with neural implants. They can exist in a kind of virtual reality or they can interact with the "meat" world with robot/android bodies known as threeps (derived from C3-PO). The hero of the first book, Chris Shane, is back. He is an adult survivor who was once the poster boy for the disease. He works as an FBI agent and this time around he's investigating a death of a player of a threep sport involving war hammers, swords, and decapitations. Just like in the first one, the mystery in the book is secondary to the exploration of what it means to be human, how should people of different physical and mental abilities be treated, and how much does our physical body matter in comparison to our mind. These are heady topics but Scalzi weaves them together with skill and without ever climbing on a soapbox. I devoured this book in just one day and I hope there will be a sequel sooner rather than later. 5 enthusiastic stars.